Chaz Davies is targeting second place in the World Superbike championship after winning both races at Laguna Seca, California. Welshman Davies trails series leader Jonathan Rae by 144 points, but is only 19 behind second-placed Tom Sykes. 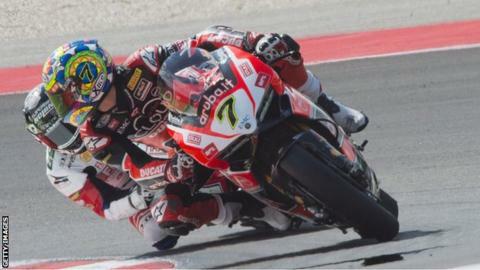 Ducati rider Davies, 23, led from start to finish with Sykes second and Rae third in both races. "It will be hard to overturn Jonny [Rae], but second is not out of the question," said Davies. "So my target is to finish second in the championship." Davies, the 2011 BBC Cymru Wales Sport Personality of the Year, started from pole position and never looked like relinquishing the lead in either of the 25-lap races. "It's the best weekend I've had in the past few years," he added. "It started well and ended even better - flag to flag, pole position - I got the set so I'm really happy and without a doubt it was my best weekend. "Laguna Seca has always been a good track for me. "It plays to the strength of our bike a little bit and there are other tracks which highlight weaknesses a little bit so that has a big bearing on the way the race turns out. "It's one of those opportunities you have to take advantage of."